Tracking Football LLC is a football recruiting service that helps college and professional football teams identify key recruits based on independent athletic data. 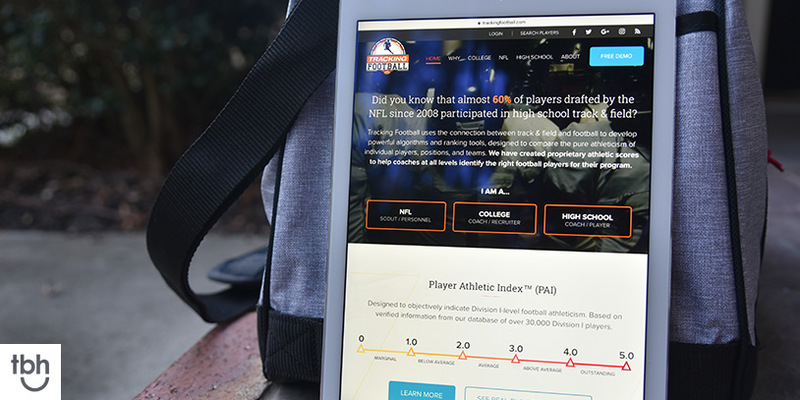 It’s a different approach to football recruiting and as a web-based product requires a site that is easy-to-use for fans while also marketing and educating their targeted prospects. 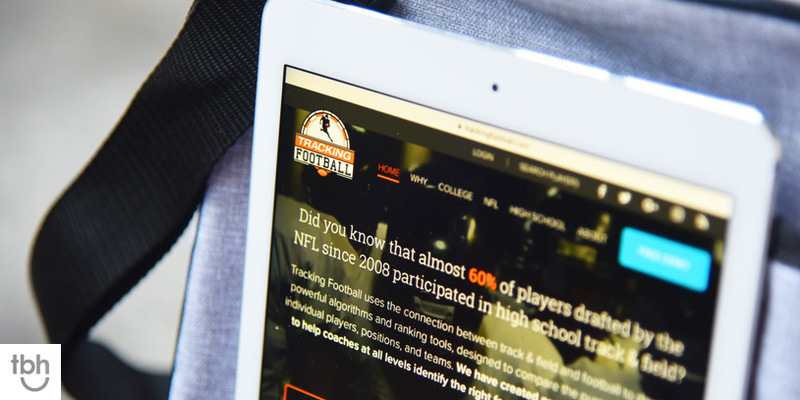 When Tracking Football contacted TBH Creative they had a functional website that they had outgrown. It was a complicated new approach they were bringing to the industry, and the website didn’t educate the marketplace well enough. They needed a more polished design. And they had some new ideas for their service that required custom online functionality. Our first step? Define a phased approach to get the new site out working in the market in the short term while strategically adding functionality upgrades over time. We started by developing audience personas and let that market knowledge guide our first phase: establishing a new site architecture and design. Phase one was focused on the front-end marketing site of Tracking Football and included a complete redesign with custom graphics and responsive designs as well as new content that both educates the marketplace and details the benefits of their service. Phase two ran consecutively and focused on the user experience and functionality of the product. Tracking Football’s website is more than just a marketing tool, it is where their service resides. Our work in phase two has extended across the year with several new releases of priority upgrades to help make it easier for their customers to search, review and compare athlete results. Here are some snapshots of the redesign work in Phase 1. 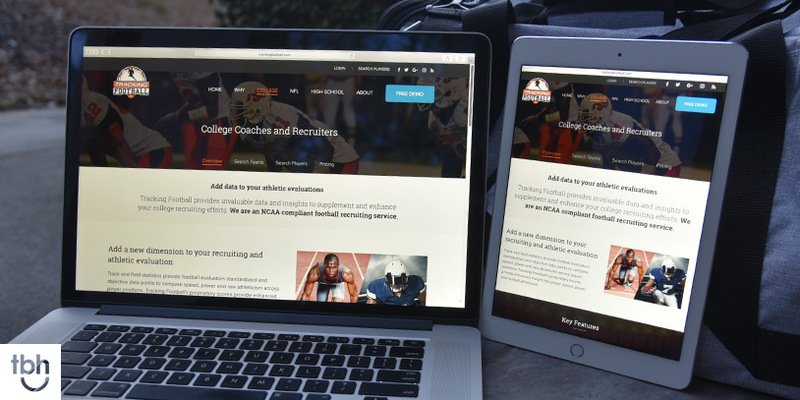 Improved lead generation: Starting immediately after launch Tracking Football reported extremely positive feedback and since release of the new site they've gained nationally known college team contracts from schools like Arizona, Texas and Purdue among others. Increased site traffic: In the first six months of 2017, the site has had 20% more unique visitors than in all of 2016. Revised architecture: One of the first things to consider in any redesign is the answer to this question: Is your website clearly communicating your benefits to your audience? Site analytics can help answer this question as can a hard objective view into your pages and menu structure. Tracking Football knew that the old site was talking about their product without talking about how it fills client needs. The new architecture lets them do more than present facts, it educates their audience and better presents all their benefits. Custom graphics: Since Tracking Football is selling a new approach with their service, custom graphics go a long way toward communicating some of the subtle details. We developed icons and incorporated video in creative ways. TBH Creative also developed new ways of presenting their data to make it easier for customers to use. "Coaches appreciate the amount of data and analytics displayed, but at the same time do not feel overwhelmed. They like the layout and the ease of functionality," notes Tracking Football COO Brian Spilbeler. Improved user experience: The new design and architecture makes it easier for users to find information and inquire for more. The improved search layout is more intuitive, and the results are now mobile responsive to meet customer demand. We are also working on stronger administrative functionality behind the scenes for the Tracking Football team. Their service is data-intensive and presented online, increasing their administrative controls lets them offer a better product to their customer. What did the customer think of the project and their new website? Thank you and your team for taking on this project and tackling all the challenges to revamp the site. I've received nothing but positive reviews and feedback on the site thus far. So you guys have done a spectacular job! 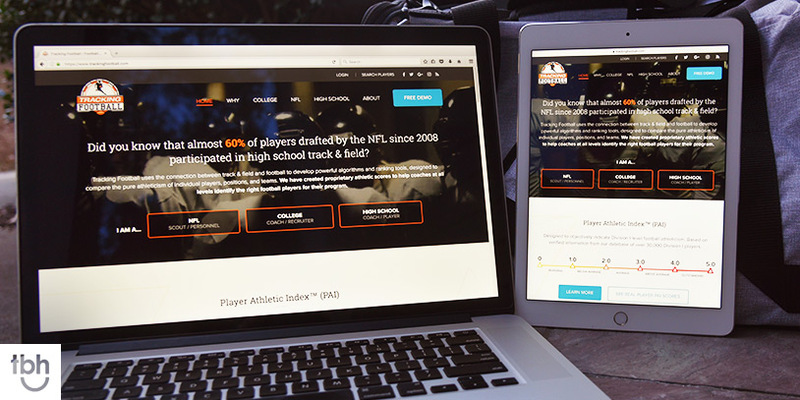 Tracking Football is a football player recruiting service with a unique approach. They provide proprietary scores based on independent athlete data that supports and enhances traditional recruiting and evaluation efforts. Visit TrackingFootball.com to learn more. Have a complicated website project and not sure where to start? At TBH Creative, we'll lead you in the right direction.